It’s funny how reviews go, at least how mine go anyhow. They sometimes head me off in a direction quite different to the one I started and I feel powerless* to change it. 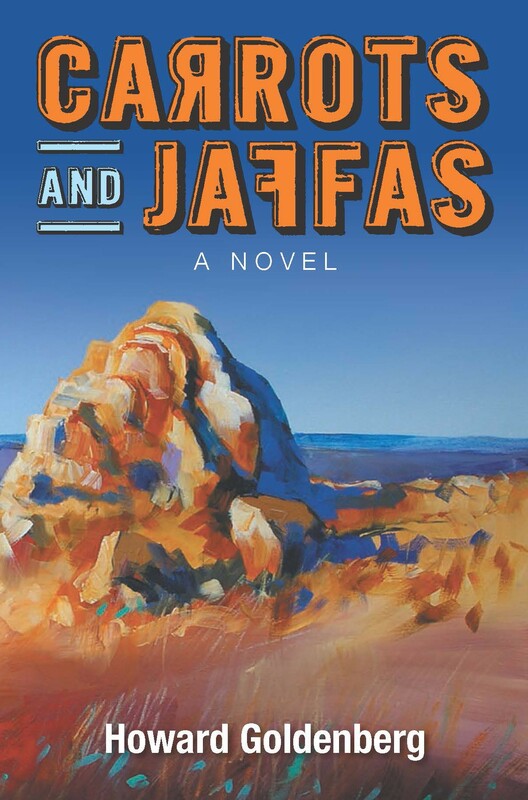 That happened with my recent review of Howard Goldenberg’s novel, Carrots and Jaffas. I started by mentioning the issue of white writers writing on black subjects but ended up focusing on the main issue in the novel that grabbed me – suffering and loss. But this is where it’s great to be a blogger: I can just write another post. I am my own boss after all! Consequently, in this post I plan to return to that opening point and discuss how Goldenberg writes about indigenous issues. I’m a bit anxious about it, however, as here I am, a white blogger writing about a white writer writing about black subjects. How far removed is that? You must read, therefore, what I say from that point of view – a non-expert who thinks the issue needs to be kept on the table. Goldenberg has tried a tricky thing. He has taken the issue of the stolen generations and spread it out in a few directions. He’s taken the universal issue of traumatic, sudden loss (of children, siblings, parents), which is what I focused on in my review, and used it to provide readers with an entrée into the very particular loss experienced by those affected by the stolen generations policy. He has revolved his plot around the abduction of a white child to provide a parallel with the large-scale abduction of indigenous children. And he has placed the abducted child in an indigenous setting, enabling him to explore different responses to land or country, which is what I want to discuss here. Three of the book’s characters are significant to this aspect of the novel. Goldenberg takes pains early in the novel to individuate the twins, describing Jaffas as interested in music, dance, beauty, as an “infant aesthete”, while Carrots is active, “exuberantly physical”. It is Jaffas who is abducted, the one more likely to be responsive to what Goldenberg has planned for him! Then there’s the indigenous woman, Greta. Goldenberg introduces us to her before she meets Jaffas, establishing her as a nurturing woman. She has brought a very sick baby, her great-niece, to see Doc, our third character. He observes her with the baby, noticing that she “crooned soft words in language, words to hold her safe”. As for Doc, we meet him just before we meet Greta. He too has suffered a loss, when his loved young sister was taken overseas by his father as the result of divorce. He’s been researching bowel infections for decades and has now gone bush to help prevent Aboriginal babies dying from diseases like dysentery. The doctor set out early. The sun blessed its morning favourites – western peaks, taller treetops, selected folds of hill. Here and there, narrow beams probed gaps in the ranges and dowered the lower slopes with gold. Doc tells Jaffas that he is in the Flinders “to learn the stories of this country”. His perspective is broad. There is, he says, only one story, which is: “Where do we come from? What are we? Where are we going?” And so, over the two months that Jaffas spends with Greta and Doc, he learns their stories. Greta tells him about her country, about how to live in it and how to relate to it, while Doc tells him his stories. He talks of fossils, telling Jaffas that “it’s a story of ‘Where do we come from? '” He tells him about the geology – about the hills that are older than time – and about the first people, the Adnyamathanha, who lived off the land for thousands of years. And he tells him that the new people, the settlers, have stories too. At times, it verges on the didactic, but then Doc is “teaching” Jaffas, and Goldenberg’s hand is light, so it works. Jaffas, for his part, absorbs what he is told, and wants to share what he has learnt. He “needs Carrots to understand the important things”. He wants Carrots to hear Greta’s stories, and the Doc’s “many stories that are one great story”. So, what is Goldenberg doing here? Well, he is writing a story about stories – about sharing stories with each other, about respecting each other’s stories, and, most importantly, about the role stories can play in healing the division between indigenous and non-indigenous cultures in Australia. Carrots and Jaffas has several themes, but is, essentially, a modern story of abduction that conveys truths about the stolen generations, and about the wrongs, in general, done to indigenous people. It’s not, however, admonitory in tone. Instead, Goldenberg offers a prescription for healing. To do this, he has presumed to “speak” through an indigenous character (not to mention through white children, an immigrant woman and white men). I believe he has done it with respect and on the basis of personal knowledge. I found it honest and effective. I look forward to hearing what others say. * Of course I have the power, but often I like the way I’m going while mourning the way I’ve left! It seems to me, at least from your review, that Goldenberg has done rather well with this complex and sensitive issue. I often think in mundane life that people would do well to remember that everyone has a story, that everyone’s story is relevant, and that by our stories, we are much more connected than we might be comfortable with (although I’d also argue that the separation is illusory, not that you can easily sell that to crowds who love to see themselves as unique). Erm, sorry, getting carried away with philosophical blabla. Anyway, you’ve certainly made me curious to read this book now. I reckon I’ve done my job if I’ve made you curious vyvienn! I like your perspective on stories and connectedness. I think that is part of Goldenberg’s point. I also like your point about uniqueness … It seems to be a very western thing doesn’t it, this lush for uniqueness over community and the group. This is so interesting! From what you say even though Goldenberg “presumes” to speak from and indigenous character, it sounds like much of the book is an attempt to show non-indigenous people what it must have been like to have your children taken away from you. It seems like a good way to approach the issue so non-indigenous people can understand better, catch a glimpse of the trauma, and perhaps become more compassionate to issues surrounding that time. Yes, Stefanie, I think that is definitely part of his drive. Another is to show the generosity of spirit of indigenous people. There is anger of course, but in my reading what is most powerful is a generosity of spirit. That’s one of Kim Scott’s points too in That deadman dance, I think. It’s about the early settlement but he suggests a lot more generosity on the indigenous side. Oh then that’s great praise if this has made you eNt to read it, MR. There’s nothing wrong btw in reading by audio, anyhow. I think you’d probably enjoy this, whichever wY you “consumed” it. I’ll definitely get hold of this one. If a message can be delivered through story without the reader feeling as if they’ve been lectured, that is success in my view. Of good, Louise … that’s great. Do tell me what you think when you read it. I think he’s achieved that.